Traditional approaches may not be enough to stem and resolve the biodiversity crisis. Since biodiversity change comes from the growing influence of humans on their environment, both natural and social science research must be combined. Biodiversity science is therefore a multidisciplinary field that uses tools and theories from different fields such as molecular biology, taxonomy, genetics, traditional knowledge, political science, eco-informatics, economics and ecology. 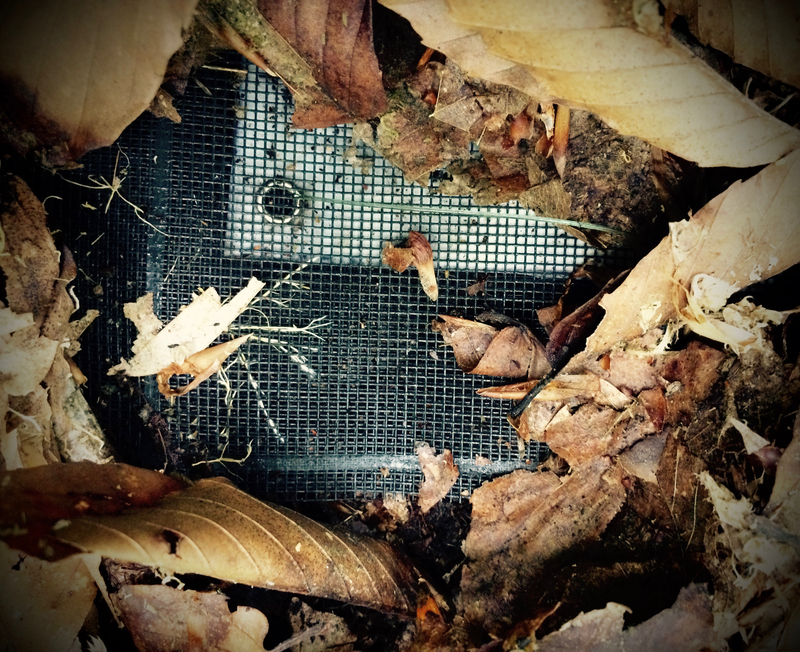 An Art-Science collaboration aiming to understand how the sounds of our environment influence us as humans and to explore the relationship between humans and the world around us, moving away from an anthropocentric view of ecosystemic interactions to a holistic one. 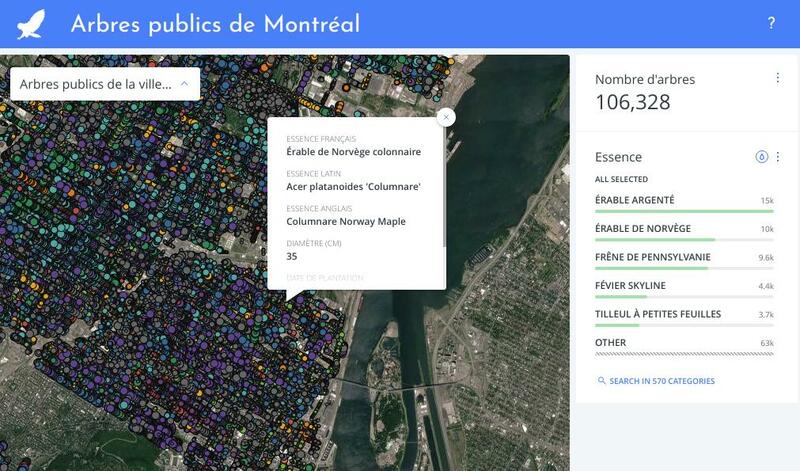 This interactive visualisation of the public trees of Montreal can be used to easily identify trees on the streets of the city. The tree inventory, which currently contains more than 350,000 trees is performed by municipal employees and the data is made available by the city on their open data portal. Development of this tool was started at an open data hackathon, and was continued by Guillaume Larocque, QCBS research professional. In 1992, Canada signed the Convention on Biological Diversity that was then endorsed the same year by the Quebec government. Article 7 of the Convention requires that signing parties identify and monitor components of biodiversity that are important for conservation and sustainable development. However, intensification of land development and climate change is impacting biodiversity in many ways. 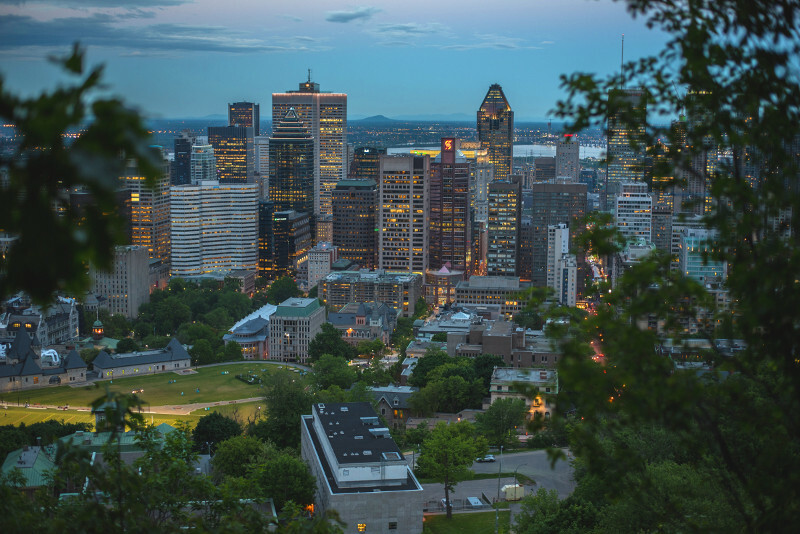 The Quebec government hopes to be proactive and to forecast effects of natural disasters and human-driven disturbances on biodiversity and to react accordingly by protecting habitats, or by managing populations in a more sustainable way. In light of this, the government has decided to ask the QCBS to improve knowledge on the economic value of ecosystem services for Quebec's business sector. 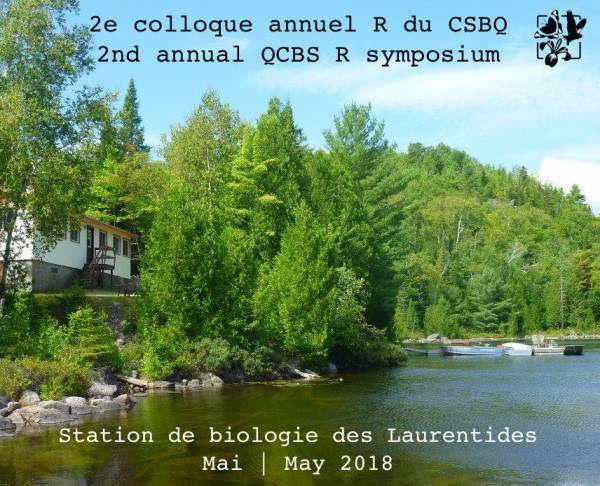 On May 10th and 11th, the second QCBS R symposium was held at the Biological Station of the Laurentians. These two days were an opportunity for the 33 students to share their knowledge of biodiversity analysis in R, through 5 different workshops. This conference was a success and we are already looking forward to organizing next year! All workshop materials are available on the symposium wiki page. A new paper from Fanie Pelletier laboratory, published at the end of March in Nature Communication, has received an incredible media attention. Only a week after its release, it shows an Altmetric Attention Score of more than 1250 points, reaching the top 5% of scores obtained to date and the 99e percentile for papers of the same age. These works have received to date a media coverage more than 150 times worldwide, and this number is still increasing. The article, Hunting regulation favors slow life histories in a large carnivore, reports the works of the doctorate student Joanie Van de Walle, and shows the indirect effects of hunting on selection and demographic processes. These works were done on a brow bear population in Sweden, where the regulation protects females with cubs from hunting. Females can keep their young for 1.5 or 2.5 years, thus favoring the survival of females that keep their young for longer periods, and their young too. 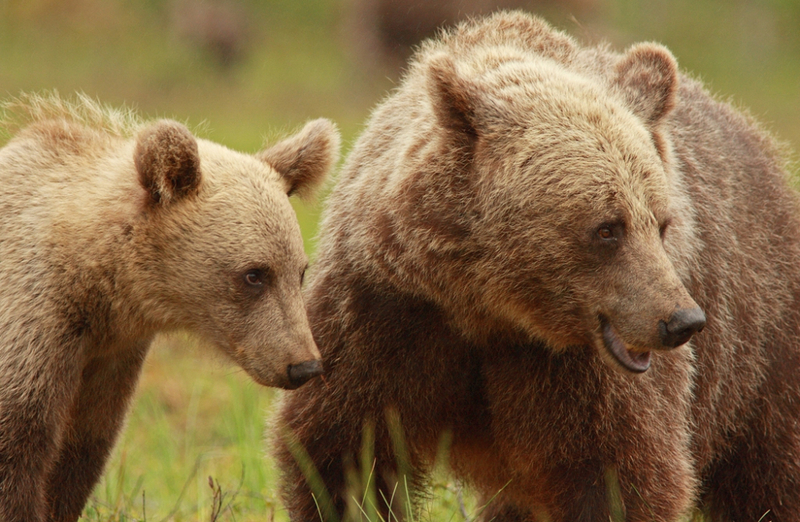 The loss of reproductive opportunity for females that keep their cubs for longer periods is compensated by a gain in survival, particularly when hunting pressure is high. 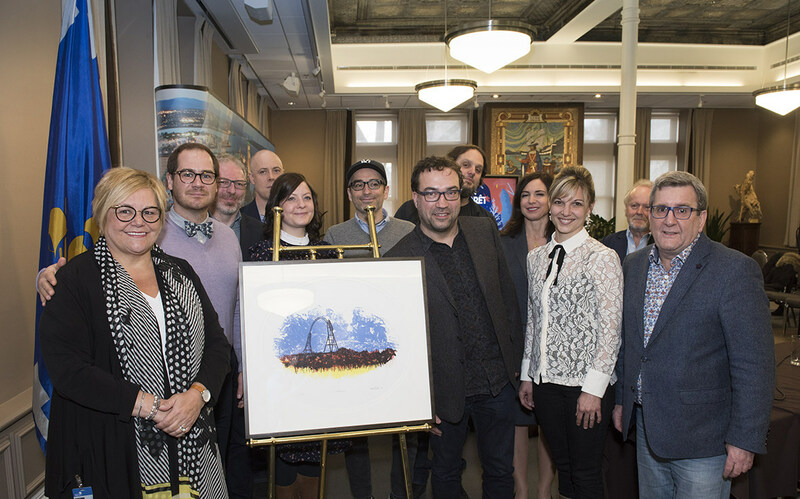 During the opening of the new multifunctional room of the Institut de Recherche en Biologie Végétale (IRBV), Professor Luc Brouillet presented the long history of this collaboration between the city of Montreal and the Université de Montréal. In 1920, Brother Marie-Victorin created the Institut Botanique of the Université de Montréal, rebranded IRBV during its move to the Montreal Botanical Garden in 1939. The institute currently hosts more than 200 researchers, students and support staff, including 11 members of the QCBS. 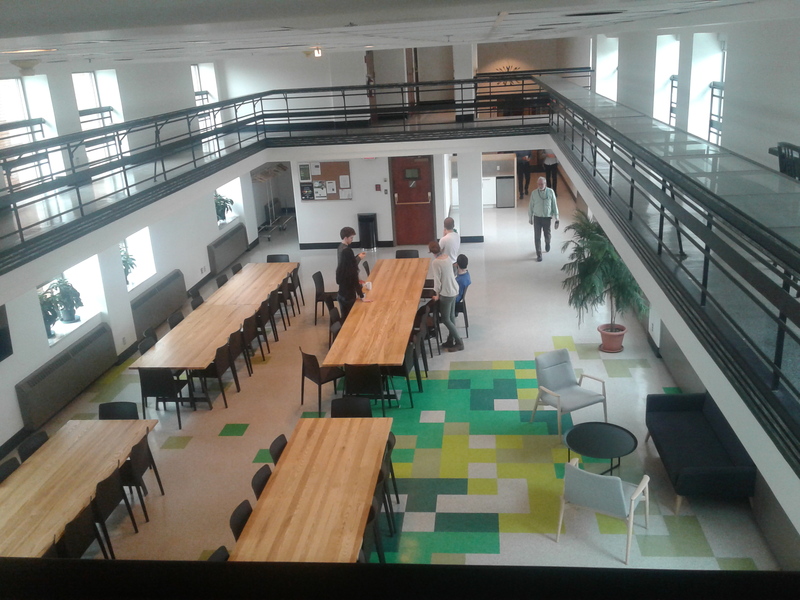 Inaugurated in 2011, the Biodiversity Centre houses the major Quebec collections of plants, insects and fungi, in addition to developing innovative research and raising public awareness of biodiversity conservation. The loss of biodiversity (animals and plants species) will continue unabated with increasing risk of dramatic shifts in ecosystems functioning and human well-being. This environmental issue is of special concern and should therefore reach the public. We wanted to compare media coverage of biodiversity with climate change, another major environmental issue. Our study, jointly conducted by researchers from Université du Québec à Rimouski, Laval University and Sherbrooke University in press in Frontiers in Ecology and Evolution compared scientific literature and press articles addressing climate change and biodiversity between 1991 and 2016. 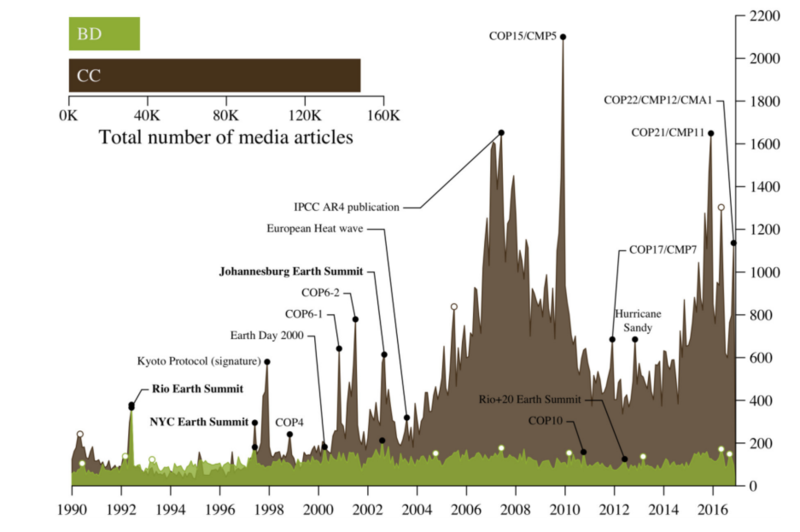 Time series analyses revealed that media coverage of climate change was up to eight times higher compared to biodiversity. Such discrepancy could not be explained by different scientific productivity or research funding between the two issues. The study finally discussed several initiatives that scientists could undertake to better communicate major discoveries to the public and policy makers. A greater public awareness regarding this issue would help implementing new policies to mitigate the impacts of biodiversity loss. Potential causes of the current native pollinator decline observed around the world include pesticide uses, lost of floral diversity and landscape simplification. In apple production, apple trees blossom soon in spring, too early for many native pollinator species, and orchards often represent undiversified floral landscapes, two characteristics limiting their attractiveness for pollinators. Actually, much of the pollination is done by the use of the honey bee (Apis mellifera). But this work could be done by native pollinators such as bumblebees Bombus spp., more efficient than honey bees, and already working early in spring, but generally rare in orchards because of the reduced floral diversity. 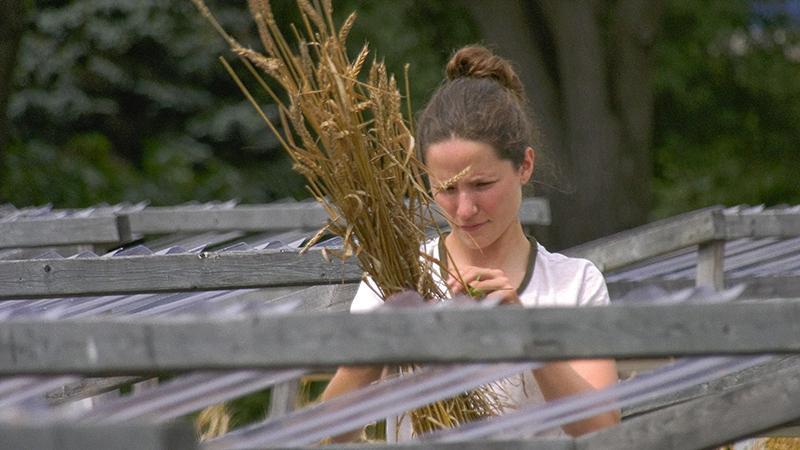 This three-year-project, in collaboration with apple producers from Montérégie and Estrie, was settled last spring by Amélie Gervais, a PhD student co-supervised by Valérie Fournier and Marc Bélisle. This study will quantify the impacts of flower planting - such as windbreaks, riparian strips and flowerbeds - on the diversity of native bumblebees and on their winter survival. Ultimately, this project will evaluate the biological and economic impacts of habitat enhancements to support pollinators in apple production. Soil is a complex system comprised of a large number of belowground interactions between the living and non-living elements. Among these interactions, many plants and fungi have developed a close relationship that can be beneficial to both partners. 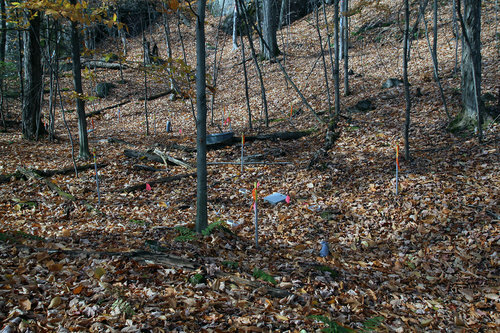 The aim of this project is therefore to better understand the interactions between plants and their fungal partners in sugar maple ecosystems found in southern Quebec. Subsequently, a field experiment will allow us to highlight the effect of plants-fungi associations on organic matter decomposition. Finally, in the context of climate change, we will attempt to determine the extent to which the expected migration of trees such as maple from temperate to boreal forests will be impacted by microbes in boreal soils. 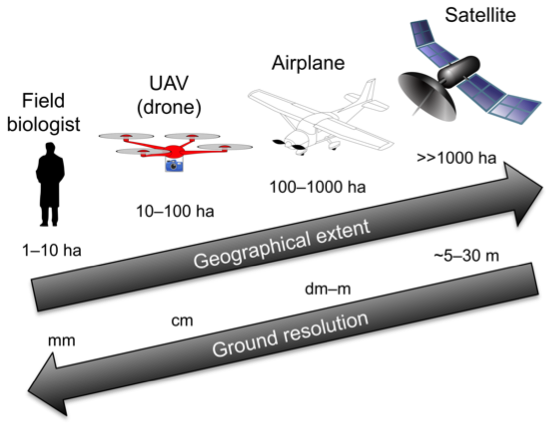 As a whole, this project aims to improve our understanding of the role of underground interactions in the functioning of ecosystems. Protected areas such as national or provincial parks help to conserve ecosystems and their biodiversity. However, few studies have evaluated the effect of land conservation in the private sector in maintaining ecosystems and biodiversity. 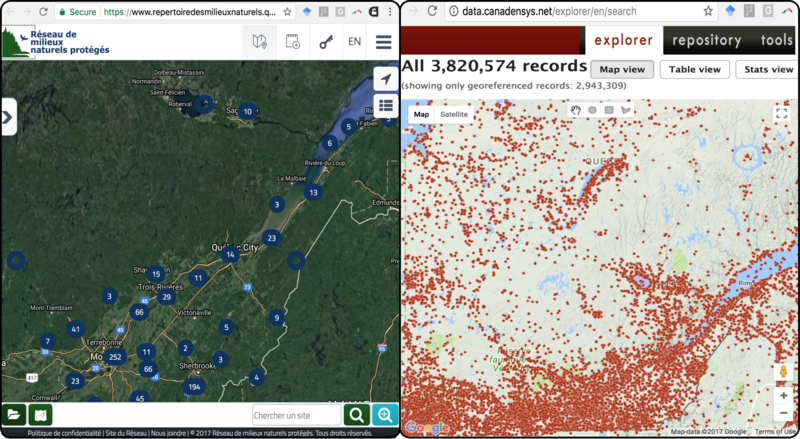 In recent years, the Réseau de Milieux Naturels Protégés (www.RMNnat.org) has developed a unique, yet still underexploited database, georeferencing most of the protected areas on private lands in Quebec. 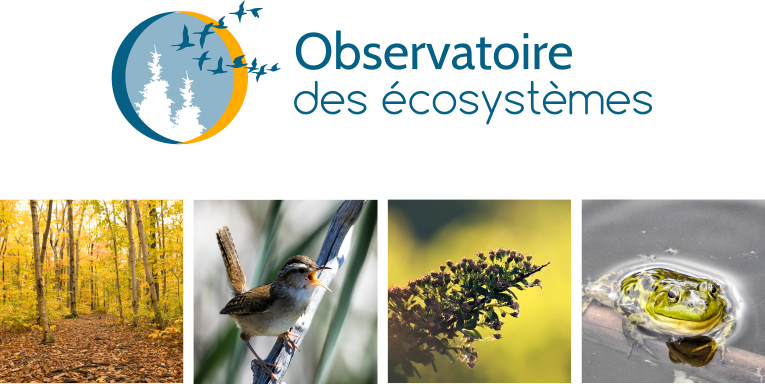 For its part, the Canadensys network has a large open database of species occurrence, and the Quebec Natural Heritage Data Center (CDPNQ) can provide data on endangered, vulnerable or potentially designated species. By coupling data on Quebec flora from Canadensys and the CDPNQ to data on protected areas from the RMN, we wish to test the effect of private land conservation on several components of biodiversity (eg, alpha and beta biodiversity) through spatial and statistical analyzes. Located in the middle of Eastern Townships, the eastern chipmunk (Tamias striatus) study site livens up each spring for more than a decade now: a team is working to collect essential data to better understand the importance of genetic and environmental factors on the maintenance of phenotypic variability. Chipmunks are individually marked with ear tags to follow them across time and to collect repeated morphological, physiological and behavioural measurements. Genetic analysis also allowed the determination of their reproductive success and the establishment of their pedigree, thus adding a genetic component to the observed phenotypic diversity. Finally, as chipmunks are sensible to the fluctuation of resources within their environment, the annual variation in the food availability, influenced by mast trees, is also quantified. This huge sampling effort has been rewarded by the quality of the research that it is producing. The purpose of this one year project is to improve the understanding of the threats identified in the Recovery Strategy for the Western Chorus Frog especially urban sprawl, agricultural intensification in relation to the need to maintain connectivity between the metapopulations in the Montérégie Region. 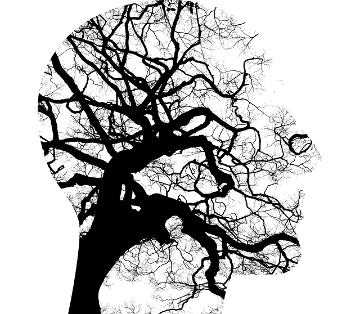 This understanding is based upon analyzing connectivity within and between metapopulations, identifying areas of importance for maintaining connectivity. In angiosperms, flowers exhibit an incredible phenotypic diversity. Their form varries tremendously from one species to another and often reflects the diversity of pollinators; plants tend to adapt in order to maximize the transfer of pollen. We studied the tropical genus Erythrina, that belongs to the legume family, as a model to better understand the evolution of floral form in response to the selection pressures of pollinators. This genus contains 131 species pollinated mainly by birds (hummingbirds and passerines) and bees. Pollination by bees and passerines, considered as the ancestral state, is associated with open flowers, while pollination by hummingbirds has likely evolved more recently. In this project, the shape of the flowers was characterized using geomorphometrics of herbarium specimens, and their evolution was inferred with a molecular phylogeny. Our results show that pollination by hummingbirds has emerged independently several times during evolution, and is accompanied by a series of similar adaptations, such as tubular flowers. This suggests that hummingbirds exert a strong selection pressure, and that the phenotype tends to converge towards a very specific floral form. This web publication aims to describe and reference the published literature on traditional animal foods known and used by Indigenous Peoples of northern North America. It features information on the locations of the cultures whose peoples have used, and often continue to use, these foods. The publication focuses on Canada, Alaska, Greenland and the northern United States of America, but many of the animal species presented here also occur in the northern latitudes of Europe and Asia. In sum, data for 527 species of animals is presented, drawing information from over 490 ethnographic sources, an additional 91 unique sources reporting nutritional information, and 357 sources containing basic biological information. Hydrological modifications to lakes and rivers are a pervasive form of environmental change in Quebec and around the world. While there are clear social benefits to regulate aquatic ecosystems (e.g. flood control, hydroelectricity), the ecological impacts are less clear and represent issues that local communities in Quebec are wrestling with. In particular, winter water level drawdowns are a common practice in north temperate reservoirs, but ecological research on this topic is limited. In partnership with QCBS and local community groups, we have conducted a synthesis of the literature as well as a field survey of reservoirs. Our research has shown that many juvenile and adult fish populations show a surge in abundance following reservoir creation but fish communities as a whole appear to be unaffected by the level of water level drawdown. In contrast, high macroinvertebrate abundances tend to only occur in nearshore sites if they are not exposed by drawdown, suggesting that benthic resources for fish could be limiting. We are now evaluating whether fish growth and diets are altered by water level drawdown. Check out the video made by FQRNT and Canal Savoir covering our preliminary findings. See video here. Every year, QCBS researchers and students develop new collaborations, co-supervise new students, write papers in prestigious peer-reviewed journals and explore new research topics. The QCBS research, collaboration and training activity dashboard is an interactive tool aiming to easily explore the dynamics of the QCBS researchers scientific production and training. It provides graphically rich summaries of our network, as it is today and as it evolves through time. Happy exploring!